When this established mountain lodge needed a complete refresh of their tired and outdated motel rooms, they turned to Outline Design for a vibrant new look. 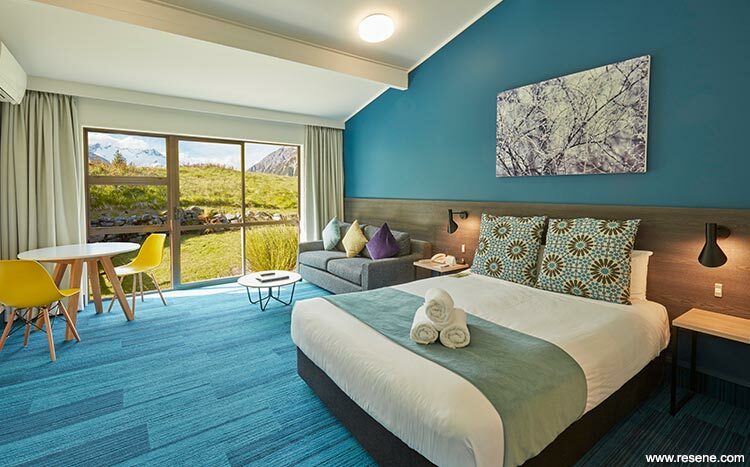 Outline Design were engaged to create a fresh, new look for the 32 motel rooms on site at Mt Cook, bringing the accommodation up to a modern and contemporary standard. The design needed to be timeless, durable, yet functional, warm and welcoming, as well as address the demands of the extreme location. 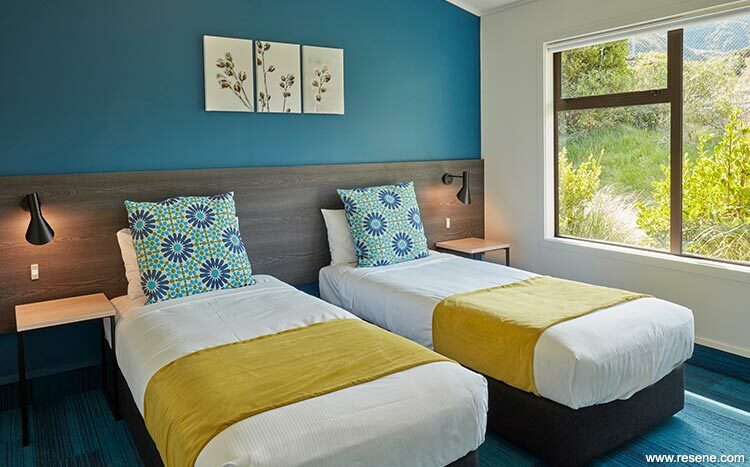 The motel rooms were to add to the overall experience and impact of the picturesque environment, offering cosy respite from the elements for guests. Understanding how important the look and feel of a room is when it comes to choosing accommodation, particularly in a remote locale such as Mt Cook with several similar and competing accommodation options, Outline Design developed an interior concept which would photograph well and entice guests via the booking website. The Outline Design team documented all 32 motel rooms, which varied in style and configuration, planning the spaces and working within the constraints of the existing build, then specified and procured all furniture, fittings and finishes including artwork and decoration, to add depth to the design and guest experience. 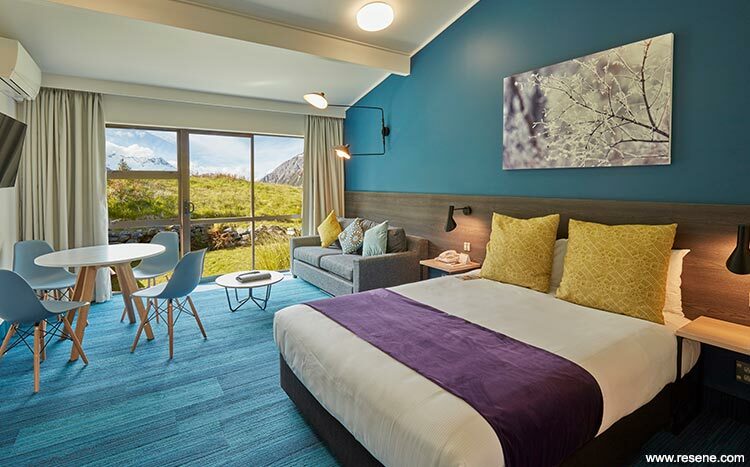 Set within the Aoraki Mount Cook National Park, the motel’s location inspired a colour palette that drew from the natural surroundings of the glaciers, lakes, mountains and grasslands. Some frosty site visits armed with Resene colour swatches led the designer to create a colour palette that was inspired by the natural surroundings of the glaciers, lakes, snow covered peaks and South Island grasses. Resene Wanaka was the perfect colour to tie in with the rich tones of the landscape, linking the outdoor with the indoor while addressing the client’s requirement to add to the overall visitor experience within such a picturesque environment. 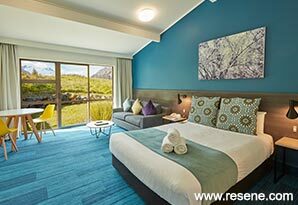 Resene Wanaka was used as a feature wall in each motel room. The colour brought nature’s glacial lake tones, visible through the floor to ceiling glazing, into each room, enhancing the experience of visiting such a unique and spectacular location. Resene Half Rice Cake was the perfect base tone to accompany the Resene Wanaka feature walls, adding further warmth and crispness to the interior environment. Fabrics and colour across the furnishings, bedding and decorative items added another layer of vibrancy and contrast within each room, creating a home away from home, a world away from the tired motel rooms that preceded it. The selected rich blue colours of the carpet further enhances the ‘Wanaka’ tone throughout the room. Given the compact spaces, Outline Design limited the base design to two key paint colours while enhancing the palette through the soft furnishings. ‘Wanaka’ and several other complementary Resene tones are referenced in decorative items such as the cushions. Colours such as Resene Funk tone with lichens, mosses and tussocks in the surrounding landscape. Resene Wicked was the inspiration for the upholstery bed runners, referencing the skies and glacial lakes that are some of the key features of the Aoraki Mount Cook National Park area. This truly remarkable landscape and location really brought the selected Resene colours to life. The remote location at Mt Cook was a challenge, with the alpine temperatures requiring additional heating for the spaces to be at a temperature in which finishes could dry and cure. The heavy snow and remoteness of the site meant site visits became quite an adventure. Logistics for deliveries and storage of product were also a challenge, along with getting teams on site for installation at appropriate times throughout the fit-out.